Our school serves school meals in 'The Galley' using fresh produce most of which is organically, locally grown , and some of which is grown at our school. All of our lunches are healthy and prepared and cooked in our own kitchen, adhering to the School Food Standards. Mrs Parker is our school cook and she works very hard to produce our meals. Our school was awarded the Food for Life Bronze Award. All lunches cost £2.20 a day and can be paid for weekly although there is an opportunity to purchase them a term at a time for a discounted rate for a limited time prior to the beginning of each new term. Order forms can be found in the school reception area or please send correct money with all relevant details (Pupil name, week start date, allergies to school office). 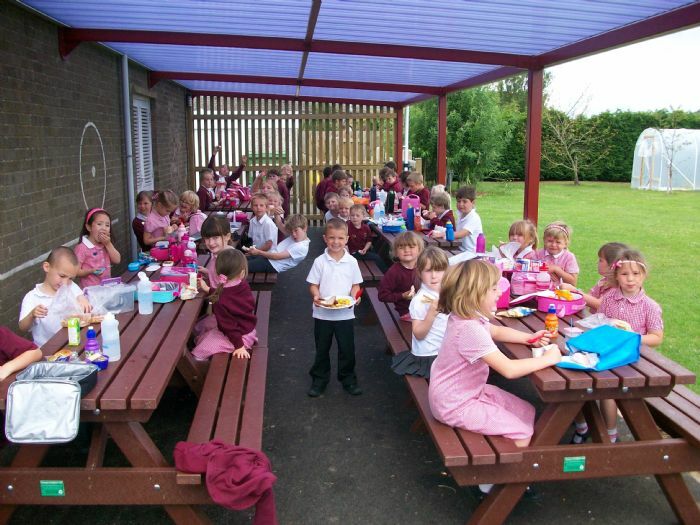 The whole school sit and eat lunch together in ' The Galley' (the school hall) but when the weather is warm the children sometimes sit outside under our canopy. The smaller children go in first so that they have a few minutes longer to eat than the older children. Grace is said before lunch everyday. Reception, Year 1, 2 and free school meal pupils are provided with a lunch daily and a healthy packed lunch when they are on trips. If you are unsure whether your child is entitled to free school meals please see the link to apply below. Free hot lunches are also available to Pupil Premium pupils after they have registered at the school office. The children in our school are all mixed up for lunch, school lunches and packed lunches and older and younger children are all seated together, so that they all get a chance to interact with children from other classes and the younger children can learn from the older children. We often have a themed lunch day to promote our school lunches. We have had an Lincolnshire lunch, a Chinese themed lunch, an Egg themed lunch and we joined in with National Roast Dinner Day. We also have 'Meat free Mondays' and 'Fish Fridays'. We like to try and encourage the children to try new things but understand there are some things they will not eat so we offer vegetarian soup everyday as an alternative to the main dish in the winter and salad, ham, egg or cheese sandwiches in the summer. Our lunches follow a three week cycle, the menu changes from the summer to winter so we can offer more seasonal related dishes and a varied, exciting, nutritional range for our children. Here are the menus: winter menu, summer menu. Please inform the school of any food related allergies your child has. Fruit and bread are provided at lunch time for the children who have hot meals and as part of our healthy schools campaign, we provide free fruit at break time for all children. We also encourage parents to order the free school milk for children under five and then to purchase the milk at a reduced price for the older children. Pupil Premium and free school meal children are entitled to free milk but must be registered so please contact the school office. Milk is provided through the organisation Cool Milk www.coolmilk.com. They can be contacted on 08001422972 or by email registration@coolmilk.com. As a healthy school we encourage children to drink water throughout the school day and each new pupil is given a free water bottle. We ask that children bring their water bottles to school every day. Replacement bottles can be bought from the school office.